As we have mentioned in the very first entry of this blog, one of our aims is to build an online community for anyone interested in geotechnical engineering. So far, however, we had only introduced a web site for that. But how can there be an online community without members? There cant’! So, we are happy to introduce the option for you to sign-up with Geotechpedia!! You can find the “Log On or Register” option on the top right corner of the site. In order to register with us, all you need to have is an OpenID account. Since most of you probably already have a gmail or yahoo mail account, you do not need to create a new account. Just sign-in using your existing one. You do not therefore need to create yet one more username/password combination. So what’s the point in signing up? Well for one you can rate what you see. The typical star rating you see in many sites, available for you to pass your judgement on what you come across in Geotechpedia as well. 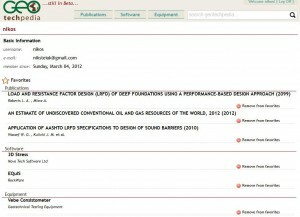 Favorites are sort of like bookmarks, but specific to Publications, Software and Equipment Records. Since our goal is to provide you with the most information we can find, we also need to provide you with a way to keep track. So each time you come across an entry you like and want to remember, you can just click on the Mark as favorite option and you’re all set! 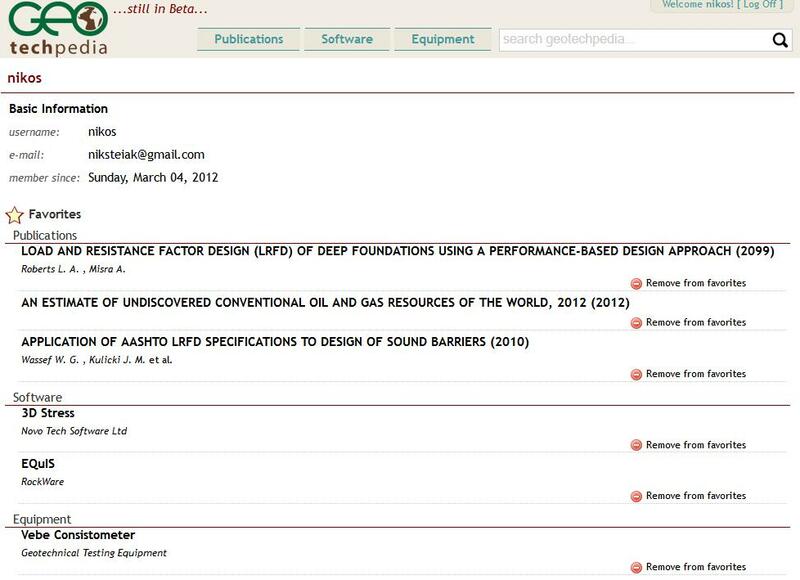 On your user page, you can find a list of all your favorite Publications, Software and Equipment.